Were you disappointed that Tyrion didn't learn an important piece of information in this week's Game of Thrones finale? Relive one of his scenes paired with the original text from A Storm of Swords. Possible spoilers if you haven't read the book, even if you've seen the finale. Redditor GipsySafety posted this reimagining of the scene where Jaime frees Tyrion from his cell. We don't know why the showrunners decided to cut Jaime's revelation to Tyrion regarding Tyrion's first wife or if the information will ever come up later. But it's an important moment in Jaime and Tyrion's relationship, and we're a little bummed it didn't make it to the screen. 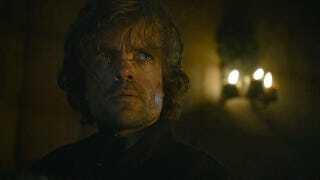 Now if only we could get another one of these image series revamping the final scene between Tywin and Tyrion.